Sorry for the tardy post. I was not home much today so I did not have a time to get to the computer and post until this ungodly midnight hour. I love this page, and am happy to finally post it. Like many Axe Cop pages, it feels like we have been thrown into a different comic suddenly. Also it’s adorable because the giant murdering sea serpent is named Maria. I’m going to be at some awesome comic cons this month and next. Comikaze Expo in Anaheim, CA. Coast City Comic Con in Portalnd, Maine. And Thought Bubble Comic Con in Leeds, UK. 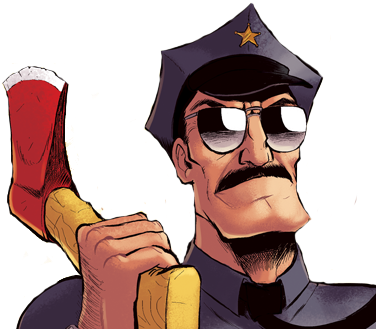 November 2nd, new episodes of Axe Cop return to FOX. I may have already told you that, but I am telling you again. I’m excited because I got to smoke a cigar with the president of the American Chesterton Society tonight and drill him with questions about my hero, GK. I know, that is super geeky and hardly any of you even know who Chesterton is, but for me it was awesome. Even better, his son-in-law was there and is a big Axe Cop Fan. Truly, this has become a family affair. They are going to have quite a story to tell about their wedding day, I tell ya! I remember my main thought drawing this scene was “Yes! please, kill Cauber Helen so I don’t have to draw it ever again!!!”. Want some good news? New episodes of Axe Cop are set to air on FOX starting Nov. 2. That is less than a month away! I’ve seen a few of them already and I can assure you they are awesome. The night creatures episode in particular is really well done. That’s all I have to report right now. Thanks for reading! The battle continues, and family tag-team metamorphosis does as well. Nothing quite like a dog, double-monkey-bat, t-rex axe cop. I don’t even know what to call him at this point. I’m excited that River City Ransom: Underground funded. There is still under 24 hours left to help them reach stretch goals. One thing I know about video games on KickStarter is that their finding goal is usually a bare minimum, so any added funding will expand the horizons of the game. Well, my 3 year old step son Ezra is hanging out with me right now and asking me a ton of questions as I try to type this. We just made a robot coloring book. As he was coloring he said, “Ethan, life is hard. Life is hard ’cause when you color you get out of the lines.” I’m going to go ahead and end this blog entry now so I can soak up more deep thoughts. Thanks for reading! It’s time ramp up the father/son team up power again, with more Ultro power high fives. I’d just like to acknowledge and thank Johnathan Mastron and Matthew Sargent who helped Kailey flat these last pages so we could meet the book deadline on this. Also, of course, thanks to Kailey for choosing to color something so insane. This bad guy is gross! I’d also like to say that I’m really happy Bunky is on the team now. I’d like to see him become his own super hero and maybe he and his new adopted brothers could join Junior Cobbb on a mission. All this instant family stuff is reflective of our own family and I think it is really great. Malachai has welcomed a lot of new people into the family because of marriages and stuff, and it’s great to be ready and excited to call someone a relative. I think family is much more a spiritual thing than a genetic thing, and our mixed up and random family is definitely proof. Thanks for reading, if you live in Nebraska I just might see you this weekend! Thanks for reading. I was in the Axe Cop writer’s room for 10 hours today, and in my car for over 2, so I need to relax with the lovely Mrs., but I am happy I already had this new page ready to go for you. Chunk is a sound right? I think it is. Well, on we go. I don’t know if I should feel shame or pride for the combination of dialog and sound effects on panels one and two, but I simply couldn’t help myself. WeLoveFine.com has posted even more awesome Axe Cop shirts. They just keep coming! I recently got to see one of the new Axe Cop episodes coming to FOX in November, when we start showing new ones again. It’s so good! Also, I went to Rose City Comic Con this weekend in Portland, OR and had a great time. Malachai came too, and so did Kailey, our colorist. It was fun meeting so many people who really love our comics. Well, more Thursday. See you then! Introducing the alien king behind it all, Cauber Helen (pronounced Cobb-er Hell-en). I remember when I designed this character, I really liked the design but was not really excited to draw it multiple times. Part of the reason finising this book out became so work intensive. 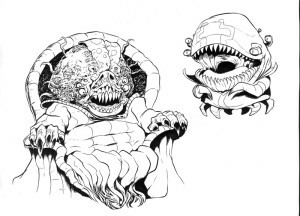 Here is two of the first concepts I came up with for the character. I pretty much went with the one that doesn’t look like a whale. We’re heading into finale territory here! I’m excited to finish this story out.